Corn Commentary | The blog about U.S. corn, corn products, and the family farmers behind it all. This is the kind of response that every ethanol supporter out there should be writing. It appears in “The Kansan.com” and was written by Dana Shifflett of Newton, who is apparently a wheat grower. I did not see the original editorial, but this writer makes excellent, well constructed points. Here are just a few – you need to read the whole thing and memorize it to fight back with some good facts. Ethanol and the cost of food: Ethanol has increased the value of the crops we grow, but the cost of our crops is a very small portion — 4 percent to 6 percent, I believe, of the price you pay for food. The majority of your money goes to the manufacturers and marketers. Rising energy costs mean higher transportation and manufacturing costs, and I believe that accounts for most of our recent food and consumer goods price hikes. For perspective: In the summer of ‘99, I paid 68.9 cents for a gallon of gas at the Sam’s Club in west Wichita, and my wheat sold for $2.25 a bushel. Today, gas is roughly $2.80 — or four times as much — and the diesel that fuels our trucks, locomotives and barges is up a similar percentage. Wheat, at $6.55, is 2.9 times as much. I don’t grow corn, but I think it’s up even less. Fuel mileage: The writer claims E10 will cut your mileage by 7 percent to 8 percent. That is not my experience. I keep logbooks for my vehicles, and I figure gas mileage and, since 1981, I’ve consistently found a 3 percent mileage improvement with E10 even though it has only 96.7 percent as much energy as straight gasoline. I think I know why, but rather than make a long story longer, I’ll let those of you with a background in physics or mechanics consider the effect of ethanol’s higher latent heat of evaporation on an engine’s intake charge and compression stroke. While you’re at it, check out this article from the New York Times and make sure to read all the comments. The article is very negative towards ethanol, but the comments are running about 50-50, although there is a massive amount of misinformation on both sides. This is the kind of article that ethanol supporters need to comment on. An interesting story came out at the end of last week on TheNorthwestern.com. Apparently some gas stations (42 of them) are upset with an ethanol production company (Utica Energy, LLC) for selling fuel below the state’s strange minimum markup law. They’ve filed a lawsuit for $12 million dollars against the company and it’s retailer, Renew E-85. Now all this “under the price law” selling took place apparently at a 2-pump station. How that had a $12 million impact on other gas stations seems a mystery to me. According to court records, the gas station owners claim Renew’s two-pump station on Lineville Road in Green Bay sold fuel below the minimum price allowed under the state’s Unfair Sales Act, also referred to as the minimum mark-up law, for 143 days straight from Aug. 12, 2006, to Jan. 1, 2007. Based on unspecified injuries, each station owner asked the court to order Utica Energy and Renew to pay each station a total of $2,000-per-day per-violation, or $286,000. At the least that sounds a little excessive wouldn’t you think? The story quotes Utica and Renew attorney Bruce Bauer. 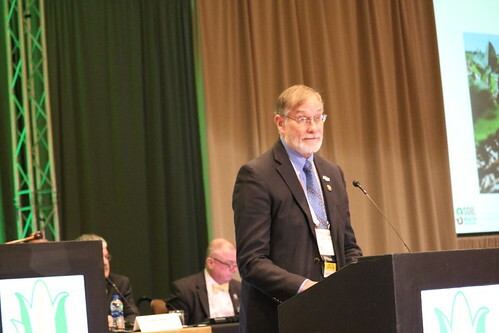 “He argues in a response to the gas station’s lawsuit that the gas station’s claims are more about the threat ethanol producers pose to “big oil” than anything else, saying the stations “ganged up” on Renew and Utica. How much energy it takes to make rocket fuel is irrelevant to considerations of weight and thrust that can be attained. If rocket fuel takes 10 times or a 1000 times as much energy to produce as it contains, it is what it is because it needs to be that compact and lightweight in order for the vehicle to lift itself beyond the bounds of earth’s gravity. If the rocket fuel doesn’t do that, it is NOT rocket fuel, it is something else. That’s really the perspective we have to get across to the nay-sayers on the efficiency issue of ethanol. Granted, we don’t really want to expend 10 units of fossil fuels to produce one unit of renewable fuels. But at this point some of the manufacturing processes, like making a tractor, are too remote from us to have a significant impact of the percentage of fossil fuels used in that process. Yet, there is no reason that one has to assume that the tractor itself is burning fossil energy while it is planting or harvesting a bioenergy crop. It could just as easily be using biobutanol (without modifications to the typical gasoline engine tractor) or biodiesel (for diesel engine tractors). If it “isn’t”, it can be argued, that is partly a matter of the alternative fuel availability which will never change if we block the creation of the alternative fuel by complaining it is “inefficient”. Doc then goes off on several tangents involving a refrigerator from Sears, methane from livestock and permafrost in the Arctic. He finally lands on the topic of ADM investing in biodiesel production in Brazil and compares Brazilian subsidies for biodiesel production with the US “ethanol subsidy” – although he does not clarify what he means by subsidy – whether it is the tariff on imports or incentives for blenders, or what. Let’s contrast just for a moment the biodiesel subsidy in Brazil to the ethanol subsidy in the USA. The factor they have in common is not the feedstock, it is ADM being the biggest player on the field. Did the subsidy created in the US federal Farm Bill require ADM to build roads, or clear shipping channels, or provide new storage facilities before the ethanol subsidy was put into effect? Does it limit the applicability of the ethanol subsidy to sources originating on small, financially struggling, family farms? Whose legislators end up looking more responsive and responsible to their electorate? And then he talks about Richard Branson’s Virgin Group investing in biobutenol. Like I said, quite a ramble, but some interesting points. The Iowa Corn Promotion Board is recognizing September as Corn Month by issuing several news releases. They’re reminding consumers about the economic importance of Iowa corn and the many products that use corn. Iowa corn growers harvest nearly two billion bushels of corn each year, or about seven percent of the world’s total production. With increased demand for corn, Iowans have planted 13 percent more acres of corn this year. That crop is then transformed into livestock products that put protein on the world’s dinner plates, ethanol that fuels more cars and thousands of other essential ingredients and products. Corn is used in more than 4,000 food and non-food products and Iowa’s farm sector supplies nearly $15 billion to the state economy each year. 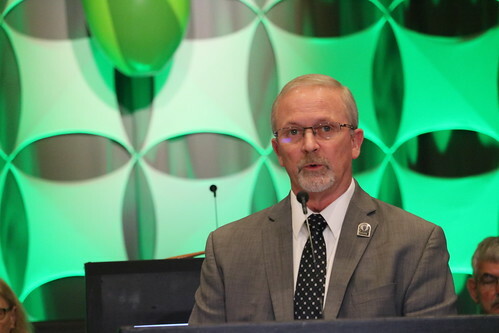 The Iowa Corn Promotion Board (ICPB) believes that agriculture will continue to meet the nation’s growing demand for both food and fuel. In addition to farmers planting more corn acres, new studies shatter the myths about the relationship between the price of corn, ethanol production and food prices. The holiday weekend caught up to us before we could get the following thoughts from the Farm Progress Show, held in Decatur, IL, posted at the end of last week. However, they’re still relevant. Thanks to Lou Malnassy, NCGA, for sending them along. At a time when high-speed internet connections have tied growers and their suppliers closer together than ever before, the idea of thousands of people traveling to a farm show may seem out of date. In fact, say two National Corn Growers Association (NCGA) officers, today’s farm shows are better than ever. Despite his exposure to new products and ideas, Litterer was impressed by what he’s seeing at this year’s Farm Progress Show, in Decatur, Ill.
“We’re seeing developments in biotechnology and genetics that are still several years away from being introduced,” he says.” There’s nothing like a farm show for that type of preview. 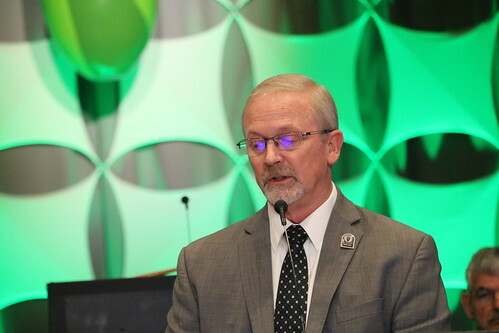 NCGA First Vice President-elect Bob Dickey sees the appeal of shows extending beyond agriculture. Litterer and Dickey also agree that the shows provide a rare opportunity to meet and talk with fellow growers. Litterer sees the general mood as upbeat. “Weather is always a concern, but early harvest figures among those attending have been very good, and growers are generally pleased,” he says. Somehow the title says it all. We can have food and fuel if we want to. If you could see the area around this store you’d see corn and soybean fields. 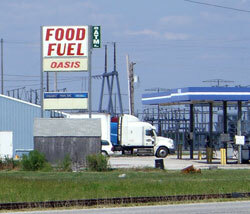 It truly is an oasis of food and fuel! The large annual farm show featured the products and technology from many companies who are working to make agricultural production more efficient not only to produce food but also fuel which will not only lessen our dependence on foreign oil but also improve our environment. 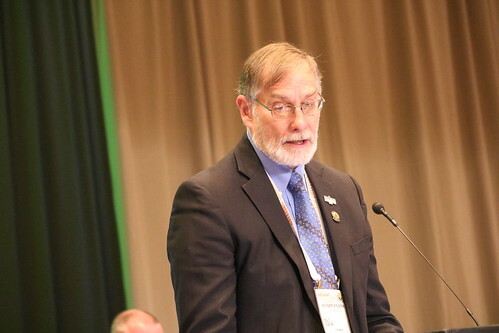 Producing more from every acre while reducing the environmental footprint on the farm are the hallmarks of U.S. farming today, says Leon Corzine, past NCGA president and one of five recipients to receive the new Abraham Lincoln National Agriculture Award. 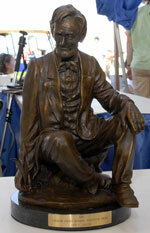 Leon received the inaugural award at the Farm Progress Show, in Decatur, Ill. for his efforts on behalf of technology. 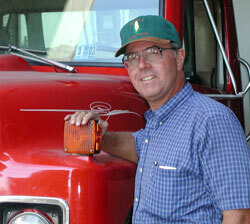 For those of you know Leon, you know that he’s a champion for the contributions of the American farmer. 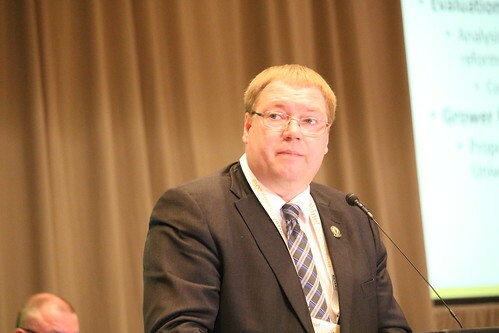 He was recognized for his national involvement to promote and adopt biotechnology in agriculture, advocacy for a governmental standard for the use of renewable fuels which led to aggressive market demand for ethanol, plus additional technological developments in grain storage, in export shipping containers, as well has his leadership for new locks and dams on the Illinois and Mississippi rivers. All in days work, huh, Leon? Other award recipients are John Block, an Illinois farmer and former U.S. ag secretary; Jim Evans, a University of Illinois agricultural communications professor emeritus; Congressman J. Dennis Hastert (R-IL), speaker of the U.S. House of Representatives; and John Huston, executive vice president emeritus of the National Cattlemen’s Beef Association (NCBA). Hats off to you, Leon, and the other award winners; America is better off because of your efforts. The Merriam-Webster definition of “dross” includes words such as “scum,” “waste,” “impurity,” “something that is base, trivial or inferior.” All of that applies to the article in last month’s “Rolling Stone” magazine The Ethanol Scam: One of America’s Biggest Political Boondoggles. Peppered with choice four-letter words, the article is a re-hash of every criticism about ethanol there is, with no balance and no responsible alternative to suggest. Where to start? Okay, let’s start with subsidies. According to the Stone, Corn is already the most subsidized crop in America, raking in a total of $51 billion in federal handouts between 1995 and 2005 — twice as much as wheat subsidies and four times as much as soybeans. One might ask the author if he has any clue how the federal farm programs actually work. One might also ask if he knows that in 2006, those subsides (which are mostly deficiency payments paid by the government when corn prices fall short of break-even) fell substantially. Why? Because the prices rose to the point where farmers were actually making money on the crop without government assistance. So much of the article is blah, blah, blah – we have heard all this before and there is no way to argue with these people because they believe what they want to believe. They won’t accept that ethanol production continues to become more efficient, for example. They are convinced we will never be able to produce cellulosic ethanol to help meet the Congressional mandate of 36 billion gallons by 2012 when corn ethanol can only hope to come up with 15 billion gallons. And the Stone, like most ethanol critics, pooh-poohs the idea that we could “only” replace seven percent of our current energy needs with ethanol. What’s wrong with that? What is wrong with producing at least SOME of our energy here in the United States, keeping the money at home instead of sending it to countries that hate us? 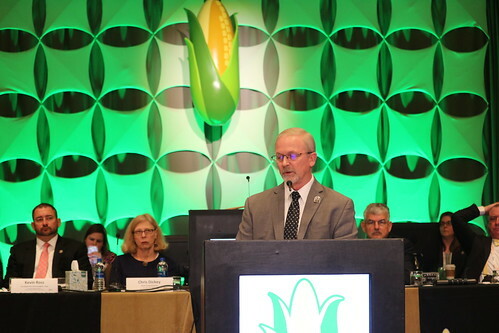 “It’s pretty clear to me that the corn guys will use all their lobbying muscle and political power to stall, thwart and sidetrack this revolution,” says economist C. Ford Runge. Really? Runge obviously has not talked with anyone in the corn ethanol industry, all of whom are promoting the future of cellulosic ethanol. Growers are investing in plants with the firm idea that other feedstocks will be used in the future – and they can grow them too! It’s unfortunate that we even have to respond to these kinds of attacks that are going on relentlessly. But, make no mistake, the reason ethanol is being attacked so viciously is BECAUSE it is good and it is right. Stand firm, make sure the facts get out there and people don’t blindly believe this kind of dross. Incidentally, Renewable Fuels Association president Bob Dinneen did take the time and effort to respond to the Stone article with a letter to the editor, which was subsequently lambasted by the article’s author. In the middle of it all is a blogger by the name of Robert Rapier – a UK oil-industry engineer and contributor to “The Oil Drum” blog – whom Rolling Stone author Jeff Goodell used as a source for many of his claims about ethanol. Dinneen challenged the “energy blogger’s” figures and in turn has been challenged to a debate by Mr. Rapier. To my knowledge, Mr. Dinneen has yet to take up the offer, but I think he should – somebody should. We can’t sit back and be weenies and keep taking this lying down. LifeLine Foods is opening a new generation ethanol plant in St. Joseph, Missouri that could eventually put to rest the whole “food versus fuel” issue. The facility features a mill in the front of the plant that separates the corn kernel into fiber, protein and starches. This technique enables increased utilization of the starch within the kernel. The resulting higher quality starches will be used for food products while the lower quality starches will be used to produce ethanol. In addition, the plant utilizes the fiber in the corn kernel to produce energy. This process reduces the plant’s dependence on natural gas and allows the plant to generate its own fuel. McCauley explains how it works. “This is the perfect fractionation process because you’re breaking it down at the front end. So, you’re actually getting the germ out, which is the corn oil. You’re also taking the endosperm out and you’re getting what we call snack grits, that make the snack products. What’s left is starch, already broken down and ready to make ethanol.” Finally you have a high protein product leftover. 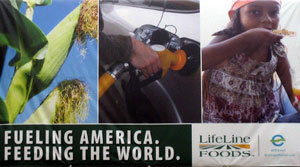 The slogan for LifeLine’s plant is “Fueling America, Feeding the World” and McCauley says it’s important for agriculture to step up and start defending itself against the critics of ethanol. “There’s nobody going hungry in the world because of ethanol,” he says. LifeLine produces ingredients for dry cereal, snacks and tortillas. Some of the flour they produce has been distributed around the world in the Food for Peace program through USDA. Consumers have a growing amount of online information that provides them with good science based information to make better choices, especially when it comes to new energy choices. 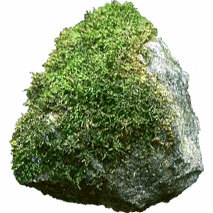 We’re going to point to them whenever and wherever we find them. Take for example a YouTube video from Monsanto that helps provide some positive perspective for food and fuel. It’s titled, “Renewable Fuels: From Farm To Fuel Pump.” This 6 minute video reviews how “Ethanol and Biodiesel can offer benefits to consumers and farmers.” The video features comments from NCGA’s CEO Rick Tolman who talks about increasing yields and the productivity of America’s corn growers.